Anti-Notch therapies are being evaluated for cancer. 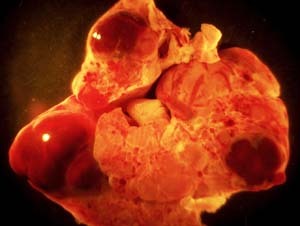 When Washington University scientists disrupted Notch1 signaling in mice, they developed vascular tumors, primarily in the liver, which filled with blood (shown) and eventually led to massive hemorrhages and death. A study by researchers at Washington University School of Medicine in St. Louis has raised safety concerns about an investigational approach to treating cancer. The strategy takes aim at a key signaling pathway, called Notch, involved in forming new blood vessels that feed tumor growth. When researchers targeted the Notch1 signaling pathway in mice, the animals developed vascular tumors, primarily in the liver, which led to massive hemorrhages that caused their death. Their findings are reported online Jan. 25 in The Journal of Clinical Investigation and will appear in the journal’s February issue. A number of anti-Notch therapies now are being evaluated in preclinical and early clinical trials for cancer. They target Notch1 as well as the three other signaling pathways in the Notch receptor family. The current research did not study any of these specific therapies in mice but instead focused on the potential side effects of chronically disrupting the Notch1 signal in individual cells. Notch plays a crucial role in determining a cell’s fate and is active throughout a person’s life. In recent years, the pathway has emerged as a target to block the formation of blood vessels – called angiogenesis – in solid tumors. Kopan says he is not advising that anti-Notch clinical trials already under way be halted. These early trials generally involve short-term use of the drugs and are designed to assess safety. However, he says patients who take anti-Notch therapies for extended periods should receive MRI scans to check for liver abnormalities. In the new research, Kopan and his colleagues engineered mice to develop random but progressive disruptions in the Notch1 gene in cells that depend on its signal. This model mimics a scenario that may occur in cancer patients receiving anti-Notch therapies for extended time periods. Then, the researchers monitored the mice for any potential negative consequences and compared the outcomes of 41 mutant mice to 45 normal “control” mice. Within several months, the experimental mice developed opaque corneas, which were already known to be associated with a loss of Notch1 signaling. Otherwise, for more than a year, the genetically engineered mice appeared to grow and develop normally. Then, for no apparent reason, they started dying suddenly. The researchers conducted autopsies on 13 pairs of experimental and control mice. They noted vascular tumors and/or abnormal collections of blood vessels called hemangiomas in 85 percent (11/13) of the mutant mice, primarily in the liver. Some of the mice developed additional tumors in the uterus, colon, lymph nodes, skin, ovary and testis. None of the control animals developed vascular tumors or hemangiomas. On average, the experimental mice lived 420 days compared with 600 days for the control mice. All the evidence pointed to abnormalities in the endothelial system in the experimental mice. Endothelial cells line blood vessels, allowing them to expand and contract as blood is pumped through the body. For reasons the researchers don’t yet understand, endothelial cells in the liver were most affected. Ninety percent of the proliferating liver endothelial cells in the experimental mice had lost the Notch1 signal. Notch plays many roles in the body, depending on the cellular context. In some instances, Notch can spur tumor growth and in others suppress it. The researchers suspect that loss of the Notch1 signal in the experimental mice releases the brakes on endothelial cell division, allowing the cells to proliferate uncontrollably, particularly in the liver. Anti-notch compounds now in preclinical and clinical trials include gamma secretase inhibitors, originally developed to treat Alzheimer’s disease. These drugs block an enzyme all Notch receptors rely on. Other drugs in the pipeline are called DLL4 antibodies, which also disrupt Notch signaling and blood vessel formation. Anti-Notch1 antibodies are also being developed. Kopan, however, says he is not optimistic about the prospects for any of them. The research was funded by the National Institutes of Health, the National Cancer Institute and the Alvin J. Siteman Cancer Center at Barnes-Jewish Hospital and Washington University School of Medicine in St. Louis. Liu Z, Turkoz A, Jackson EN, Corbo JC, Engelbach JA, Garbow JR, Piwnica-Worms DR, Kopan R. Notch1 loss of heterozygosity causes vascular tumors and lethal hemorrhage in mice. The Journal of Clinical Investigation. February 2011.